Spending time together outdoors is good for the whole family. Don’t let bug bites ruin your fun. 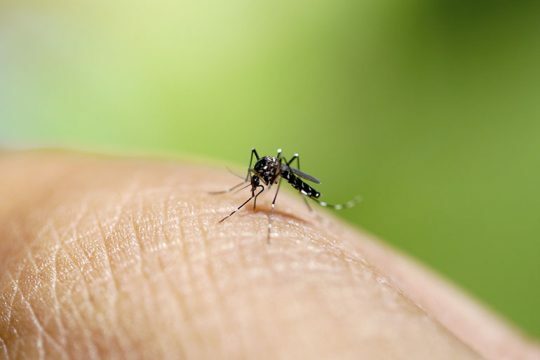 Most bug bites are harmless, but some mosquitoes and ticks spread viruses and bacteria that can make you sick. Some of these viruses and bacteria are very serious – and may be deadly. Mosquitoes spread viruses like Zika, West Nile virus, chikungunya, Eastern equine encephalitis (EEE), and dengue (“DEN-gee”) fever. Lyme disease and Rocky Mountain spotted fever are just 2 of the serious diseases you can get from ticks. The good news is that you can take steps to protect yourself and your family from mosquito and tick bites. Protect yourself from mosquitoes and ticks. Wear long-sleeved shirts, long pants, and socks to cover your skin. Use bug repellent (also called bug spray or insect repellent) on your skin and clothing. Check everyone for ticks after spending time outside. Take a shower after being outside to help wash away ticks. Use a veterinarian-approved tick collar or spot-on repellent on your pets. Dogs and cats need different tick control medicines, so make sure to get the right one. Remember to check your pets for ticks. Keep mosquitoes away from your home. Once a week, check items near your home that can hold water (like planters, birdbaths, or trash cans). Dump out the water and scrub the inside of the item. Get rid of things you’re not using that can collect water (like buckets, tires, or old toys). Change the water in your kids’ wading pool at least once a week. Be sure to store the pool on its side. Use screens on windows and doors to keep mosquitoes outside. Repair any holes in the screens. Keep ticks away from your home. Clear bushes, tall grasses, and fallen leaves from around your home. Mow the lawn often. Use wood chips or gravel to separate your patio or play equipment from wooded or brushy areas. Remove plants that attract deer and put up a fence to keep deer out of your yard. Consider applying tick control products to your yard. You can do this yourself or hire a pest control company. Bug repellent makes it harder for mosquitoes and ticks to find you. What type of repellent do I need? To prevent tick bites, use a spray or lotion with 20 to 30% DEET. Check the label. To prevent mosquito bites, use an insect repellent with DEET, picaridin, IR3535, oil of lemon eucalyptus (OLE), or para-menthane-diol (PMD). It’s a good idea to use sunscreen when you are outside, but use a separate sunscreen lotion. Don’t use bug repellent that has sunscreen already mixed in. Use a spray with permethrin on your clothes, shoes, and camping gear to repel and kill ticks and mosquitoes. Never use permethrin directly on your skin. How do I use bug (insect) repellent? Apply sunscreen first, then put on bug repellent. Spray it on your exposed skin before you go outside. Don’t spray repellent directly on your face. Instead, use your hands to carefully rub it on your face. You can also use wipes that contain bug repellent to protect your face. Don’t use repellent on babies under 2 months old. Instead, cover their stroller or car seat with mosquito netting. Don’t use OLE or PMD on children under 3 years old. Wash repellent off skin with soap and water when you go inside. Wear long pants, shirts with long sleeves, and socks. Cover up your skin so that it’s harder for mosquitoes and ticks to bite you. This is especially helpful in the morning and evening when many mosquitoes often bite. Take a shower after being outside in an area that might have ticks. A shower can help get ticks off of you and lower your risk of Lyme disease. Try to shower within 2 hours of going back inside. Check for ticks after spending time outside – even in your yard. Use tweezers to remove a tick as soon as you see it. Grab the tick near its head or mouth (the part closest to your skin). Gently pull the whole tick straight out. Be careful not to crush or twist the tick. Wash your hands and the bite with soap and water. Put rubbing alcohol on the bite. Don’t use a hot match to kill and remove a tick. Get rid of the tick by putting it in rubbing alcohol or flushing it down the toilet. You can also put a tick in the trash if it’s in a sealed container or wrapped tightly in tape. Remember, never crush a tick with your fingers. Tell the doctor if you get sick after a tick bite. If you or your child gets a rash or fever after getting bitten by a tick, call the doctor. Tell the doctor about the tick bite, when it happened, and where you think you were when you got the bite.